Welcome to the International Wooden Bow Tie Club! Become a member when you purchase your wooden bow tie. A wooden bow tie will evoke admiration from family and friends. It will fascinate strangers and arouse envy! I hand sculpt each individually. No two will be exactly alike. Getting yours is easy, find out more! By wearing an official IWBTC wooden bow tie you can actually get improvements in your life. 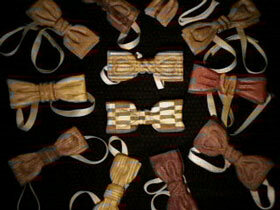 Wood bow ties can be ordered by contacting us through our online form or by calling us at 203-265-3001. HEY THERE! Something new has been added! "Colorful wooden bow ties to brighten your wardrobe!" Check out SELECTIONS!! - Not To Be Missed!! They said "There's a gent ..
Who pines to be knotty, oh my!"